Desmophyllum dianthus is a cosmopolitan species usually found at 1000–2500 m depth in the deep ocean, but in the Patagonian fjords can be found in shallow waters up to 8 m due to deep-water emergence. 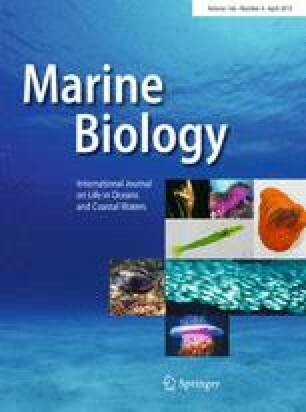 The purpose of this study was to determine the reproductive biology and seasonality of the scleractinian cup coral D. dianthus from the Chilean fjord region using histological techniques. Corals were collected via SCUBA approximately every 3 months from August 2012 to September 2013 from three sites—Lilihuapi (n = 76) and Punta Huinay (n = 59) in the Comau Fjord; and Morro Gonzalo (n = 44) in the Reñihué Fjord (42.0°S–42.35°S). This study determined that D. dianthus is dioecious, and reproduction is highly seasonal, spawning at the end of austral winter (August) and beginning gamete production in early spring (September). Gametogenesis tracks with known fjord primary productivity and the fjords were coolest and most saline in August, potentially cueing spawning. Owing to the presence of late-stage oocytes in August 2012 and the absence of larvae, we hypothesize that D. dianthus’s mode of reproduction is broadcast spawning. Oogenesis starts in September with previtellogenic oocytes (25–200 μm) that slowly develop into vitellogenic oocytes (200–380 μm) by June. Fecundity is high compared to other deep-sea scleractinians, ranging from 2448 (± 5.13 SE) to 172,328 (± 103.67 SE) potential oocytes per polyp. This research provides the first insight into Desmophyllum dianthus’s reproductive biology and yields an important baseline for continuing work on this benthic habitat builder. Responsible Editor: by D. Gochfeld. The online version of this article ( https://doi.org/10.1007/s00227-019-3495-3) contains supplementary material, which is available to authorized users. We would like to thank the Huinay Scientific Field Station for being the base camp for the field portion of this study. Our deepest thanks and appreciation for Dr. Laura Grange, Chris Riguad and all divers and scientists who collected samples for this study. In addition, we would like to thank Dr. Kevin Ecklebarger, Dr. Robert Steneck and Dr. Damian Brady for their advisement on this project. We thank University of Maine undergraduate Maggie Halfman and graduate students Ashley Rossin and Elise Hartill for their help with processing. Lastly, we thank the two anonymous reviewers for their helpful comments and edits of this paper. This research would not have been possible without the support of National Geographic (GEFNE26-11) and the National Science Foundation (OCE-1219554), and funding for field work was partially provided through Fondecyt project number 1150843 and 1161699. This is publication number 141 of Huinay Scientific Field Station. This work was funded by National Geographic and the National Science Foundation (USA), and the authors declare there are no conflicts of interest. All applicable international, national and/or institutional guidelines for sampling, care and experimental use of organisms were followed and all necessary approvals have been obtained.